Chris Long will be back with the Eagles in 2018. 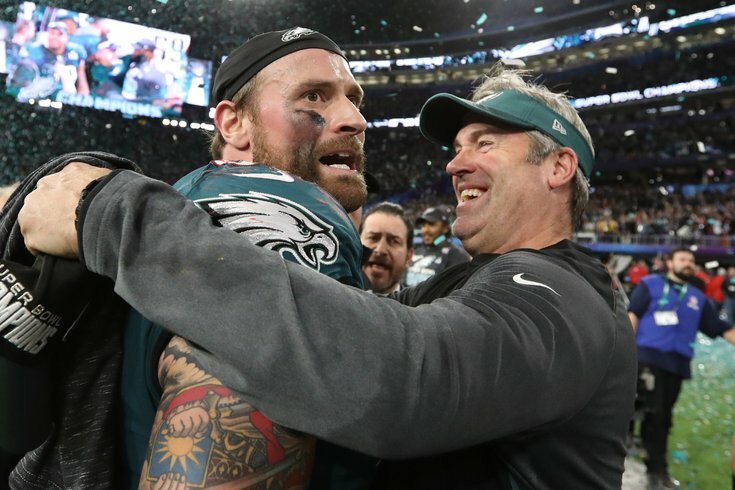 After some hand-wringing that Philadelphia Eagles defensive end Chris Long might call it a career after winning his second Super Bowl in as many years, Howie Roseman stated on Monday at the NFL Annual Meetings that Long will play at least one more season with the Eagles. "Confirmed," said Roseman. "Chris is a hugely important part of our team, and I think sometimes there's this perception that Chris is hugely important part of the team because of what he does off the field, which is a big part of Chris Long. He's an unbelievable teammate. "But Chris Long is really productive, and when you go back and you watch our games against some of the best teams in football and in the NFC -- you look at the Rams game, and the Falcons game, you look at the Vikings game, you look at the Super Bowl -- the guy is getting consistent pressure on the quarterback. So, confirmed." During the regular season, Long had 5 sacks and 4 forced fumbles. In the playoffs, he generated perhaps the biggest play in the NFC Championship Game, when he affected a Case Keenum pass that was returned for a touchdown by Patrick Robinson. With the Eagles having moved on from Vinny Curry, and now the uncertainty surrounding Michael Bennett and his odd circumstances, knowing that Long will be part of the defensive end rotation once again should be looked at as something of a sigh of relief by the Eagles' fan base.